Miryem is the daughter and granddaughter of moneylenders, but her father’s too kind-hearted to collect his debts. They face poverty, until Miryem hardens her own heart and takes up his work in their village. Her success creates rumours she can turn silver into gold, which attract the fairy king of winter himself. He sets her an impossible challenge – and if she fails, she’ll die. Yet if she triumphs, it may mean a fate worse than death. And in her desperate efforts to succeed, Miryem unwittingly spins a web which draws in the unhappy daughter of a lord. Irina’s father schemes to wed her to the tsar – he will pay any price to achieve this goal. However, the dashing tsar is not what he seems. And the secret he hides threatens to consume the lands of mortals and winter alike. Torn between deadly choices, Miryem and Irina embark on a quest that will take them to the limits of sacrifice, power and love. I have to admit that going into this book I had some very high expectations. 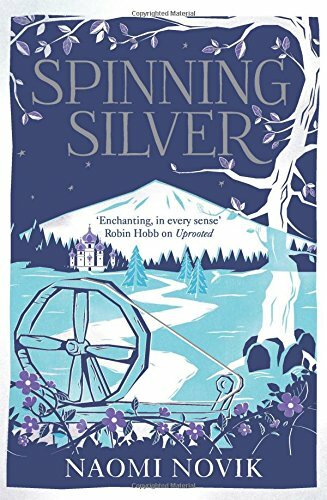 The early reviews for Spinning Silver were really positive and some were saying that it was even better then Naomi Novik’s previous book, Uprooted. I have yet to read Uprooted but if its anything like Spinning Silver then I know I will absolutely fall in love with both the story and the writing just like I did when I read this book. Spinning Silver is a story about three young women and how their lives cross with each other. Miryem is the daughter of a money lender who has to take over her father job just to keep her family fed. Wanda lives at home with her two brothers and abusive father. Irina is a noble whose father has arranged for her to be married because of political reasons. But when the King of Winter, the Styark, finds out about Miryem and her business he wants a favour from her which changes the lives for all three women. I connected with each of the characters stories but if I had to decide on one character I liked the most that would have to be Miryem. She isn’t always the most likeable character, but she means well and wants to give her family the better life. All three women show strength and determination thought the story, and makes reading the book a much more thrilling and engaging experience. Even though there is three main characters with three different stories, the entire story flows into one interesting and intriguing read. The story is so magical and whimsical thats its hard not to get swept up into this special world. Even though this is a pretty thick book I didn’t find the plot to become dull or disinteresting. I was fully entertained and and enjoyed every minute. Naomi Novik’s writing is just as gorgeous as the front cover of the book. From the very first chapter I was transported to this magical world and never wanted to leave. The writing is so rich in detail that its easy to visualise the world and its characters while reading. I would sit for hours reading, and even when I wasn’t reading the book I was thinking about the characters and story. Spinning Silver is a wonderful, magical story that will make you fall in love with reading all over again. Loved every minute reading this book and I know I will feel the same when I read it again, and again in the future. If you are looking for a beautiful whimsical read with a twist on the Rumplestilskin fairytale, then Spinning Silver is the perfect book for you. I will be definitely buying Uprooted soon just to experience the writing, the world building, and the characters all over again.